Yesterday we got back from our ‘Holiday’, a camping trip to Devon. Ok, I know, everyone is doing it now, ‘Stay-cationing’, instead of going abroad. The perception is that it’s supposed to be cheaper. It’s not. Not really. You end up spending as much in petrol as you would on a plane ticket at today’s prices. You still have to buy food and eat out when you can’t be bothered to cook (if you go self-catering). You still have to entertain the children, and go and see the local sights which means paying entry fees for the privilege of feeling like a tourist. Not to mention, camp sites; once the bastion of cheapness as far as accommodation is concerned, have cottoned on that the almighty tourist pound could now just as easily be heading their way than to the Costa-Lotta-Money; added slightly nicer facilities and wi-fi access and doubled their prices (plus extra if you take a child/dog/want electricity). So, no, we didn’t choose to go camping to save money. It’s just that over the years we, and the children despite their young ages, have already done the traveling thing, as it relates to planes and hotels and exotic things, many times over, and more intrepidly than most. To the point where camping, especially in the good ol’ British climate, is a novelty. Plus the camping equipment collected over a long period really needed an outing. So, it was all packed up into the van and off we went, to a campsite we’d pre-booked a couple of months ago (when we had the money available to pay for it); I’d noticed in the 2006 edition of the AA Camping and Caravanning guide we had gathering dust on the bookshelf. It’s on hilly ground, so expect to get tired out just walking from area to area but with that said, there’s not much distance between the ‘zones’ anyway; and plenty of places to sit and rest and eat and drink. And really, as with other theme parks though maybe not to the same extent, more to see than you can fit in to one day. As it happens, spending more than 2 nights in the campsite entitles you to free entry into the park; and since we wanted a leveled pitch with electric hook up (Sorry, Glamping this year..not in the mood for completely Bear Gryllsing it just yet), and the minimum booking for High Season (Read = any time it’s a school holiday) was 7 nights, weekend to weekend, we booked Saturday to Saturday and therefore knew we had the theme park entry as a back up. We saw everything, tried everything, tired out the boys, spent as much time as they wanted on different things, and they STILL weren’t bored by the end of the week. All in all I think we spent 2-2.5 days away from Woodlands, exploring local sights and towns of interest, spent an evening at the Salcome Regatta nearby; but were easily entertained and suitably nourished by 3-4 full days within the theme park and its choice of food outlets and refreshment booths. We have one boy who’s more into thrill rides so found enough to excite him; another who loves any creature feature (he was thrilled to be able to help collect the chicken eggs – every day at 5pm – and watch pig racing, and hold a giant snail and a tarantula and a cockroach; and see bats and other nocturnal animals in the dark; and a fearless toddler who would love to do what the other two do…and had the chance, because the toddler areas were safe enough for toddlers but still fun enough for the older two to participate and find the fun in them too. Of course, it’s camping, so there’s enough mud and dirt and bugs to go around, but as with most camp sites these days, there are unisex/family cubicles and washing up facilities and coin-operated laundry, and on-site shop for bread and milk and a selection of bits and bobs and camping accessories. Highly recommended…in all honesty, I was expecting a little less from the theme park but it more than lived up to expectations. And we had a couple of ‘hot’ days (by UK standards!) to make the most of getting soaked on the water slides and not freezing to death afterwards! 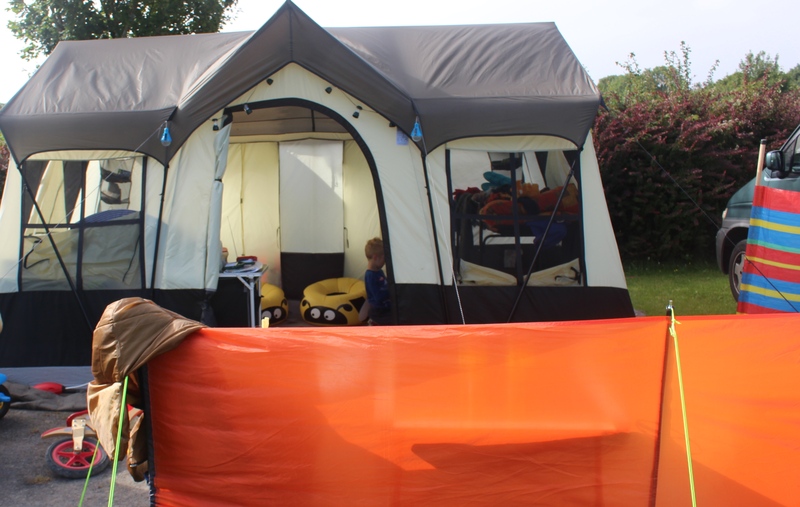 Just in case anyone’s interested, our tent (pictured at the top) is one like this although not sure about UK retailers, we acquired it while traveling in the USA. Other items we’ve gathered over the years from various camping outlets like Go Outdoors, and Ebay and car boot sales.